Lately I’ve been thinking about the power of imagination and the many possibilities it opens up to us. As a hymn writer, I can be very attached to a word or phrase, even if my readers say that its meaning is unclear. A large part of my resistance to changing the problematic phrase is a temporary paralysis of the imagination. I’ve lived with the text as it is for a long time, and it’s hard to think of another way to express the same idea. Sometimes it takes several hours, even several days or weeks, before I can get outside the “box” in which I’ve enclosed the idea. 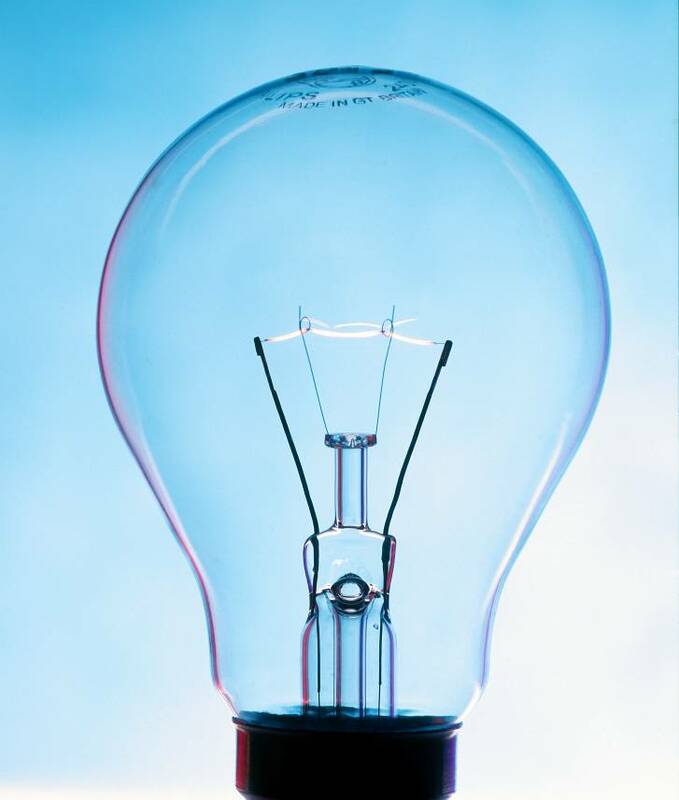 Thomas Edison realized that the key to success was the willingness to imagine a different solution over and over again, until he came upon one that worked. 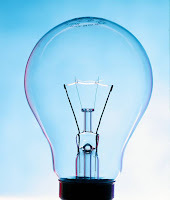 He discovered the light bulb, and I’ve discovered that his method works for writers, too! Note: Sister Delores Dufner has agreed to "blog" for us on the fifth Tuesday of the month. She is the author of many popular hymns. Her books, The Glimmer of Glory in Song and Sing a New Church are available at Whitby Gift Shop. For more information, click here. In late February, I was bemoaning the fact that it was cold and dark, and that winter seemed endless. The snow was piled high and was getting that dirty, gritty look. Is it just me, or does it seem to anyone else that all of a sudden, in just one day, the sun was out, the snow was all but gone and the world looked bright again? Walking past the Whitby Gift Shop, I noticed that the soft green “Lamb’s Ears” were poking through the dead, brown of winter. The cardinals were singing, sparrows were darting in and out of the bird bath and March Madness was upon us. In my home town of Breckenridge, Minn., the Red River of the North began its colossal and inexorable flow to the cities of Fargo and Grand Forks. All of this gives me pause to do Visio and Lectio Divina on the circumstances of the world around me. The purpose of Visio Divina is to develop awareness: to see “behind the seeing” in order to become aware of the presence of the Holy One and the sacred meaning contained in all things in our lives. 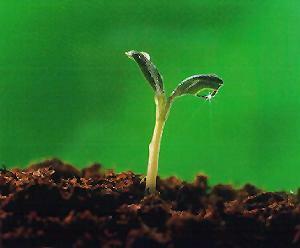 In this case, I am drawn to acknowledge again with awe the monumental changes of the seasons, the continuous dying and rising of new life, the determination of all that is living to survive and become new again. Even the raging flood waters cannot stop this determined movement to life. What will you say to this Generous Creator who never stops calling us out of death to new life? During Lent, we are given Scripture readings for Lectio Divina. As we listen and ponder, we become aware of the presence of the Holy One in our lives and are invited to respond. What will you say to this Divine Gardener who abundantly blesses your life? We looked at the imposing structure the Sisters built in 1940 on property they bought in Kaifeng. Unfortunately they lived in it less than a year before WWII broke out. This was to serve as their home and as a dispensary for the poor in the area. Eventually their goal was to found a community of Chinese Sisters. That was not to be in Kaifeng. It was quiet around the display on the concentration camp. One women whispered, “This just gives me shivers.” One man standing there said, “Whatever convinced them to stay in China? Why didn’t they leave when they had the chance before war broke out?” I thought of an answer Sister Wibora gave many years later when asked a similar question in an oral interview. Her answer: “Once a missionary, always a missionary.” This may account for a comment made by another viewer: What was most obvious in the exhibit was the Sisters’ dedication and sacrifice. As we reached the part of the exhibit on Taiwan where the Sisters went when fleeing the communist troops in 1948, we heard a story of the “precious orphan,” one of the abandoned baby girls left at the Sisters’ children home. This baby, near death when discovered, became a favorite as she was being nursed back to life. She lives today in the U.S., in Minnesota, not far from Pat (who was Sister Jacinta, one of the Sisters who cared for her). The two have become reacquainted and reconnected. Pat is going to bring her to the monastery to see the exhibit. The religious community that the original pioneers had hoped for in Kaifeng is a reality in Taiwan—Saint Benedict Monastery at Tanshui. Ten Sisters comprise the community, living the Benedictine way of life that was introduced into China by six Sisters from St. Joseph, Minnesota. Come and visit the exhibit and share with us your responses. To see video previews of the exhibit, click here. 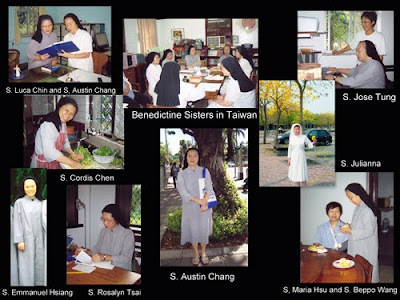 photos: top: a collage of photos of the Sisters at St. Benedict Monastery in Tanshui, Taiwan. Below right: an areal view of the monatery in Tanshui, Taiwan. As one year follows another in my life, I realize the accuracy of a statement made by F. Richard Rohr, OFM. He says that two challenges in our later years are forgiveness and letting go. Lent provided time to look at that reality a little more closely as I reread the book, My Grandfather’s Blessings by Rachel Naomi Remen, MD. The line from this book that created a mantra in my being was the following comment Rachel’s grandfather made to her about blessing others. no matter how deeply it has been buried or for how long. 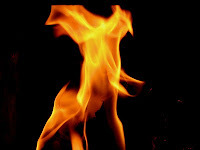 The immediate image that surfaced for me as I read this was “blowing on the God-spark“ so that it can burst into flame. I recognized how easily, in ordinary times, my anger surfaces over tiny things. So I began using that anger-moment to blow an actual “puff of attention” on the God-spark of the person that I chose to be angry at and simultaneously to let the “puff of attention” blow on the God-spark in me that needed strengthening. It’s been amazingly humbling. On March 9, the Church and the Benedictine world commemorated the passing of Frances of Rome in 1440, the patron of Benedictine Oblates. Little is known about her and one reason is that she did not leave any writings under her name. Most of the information we have is from the proceedings for her canonization in 1608. Frances was born in 1384 into a noble family of Rome. She was married at the age 12 and lived with her husband's family. In time she took over the administration of the household and had three children, 2 boys and one girl. As a young woman, Frances tried to combine her domestic responsibilities with those of motherhood, service to the poor of Rome, and her spiritual life. In time it all became too much for her and she had a breakdown. By the time she recovered, about a year later, she had learned how to interweave and balance the three major threads of her life: her family life, her life of service to the community and her spiritual life. As the years passed, she worked tireless for the people of Rome during the plague, wars and other calamnities, as well as caring for her husband, children and the needs of the household. According to Susan Anderson Kerr who wrote the chapter on Frances in the book Benedict in the World: Portraits of Benedictine Oblates, "the monastic orders, both the Augustinians and the Benedictines, were in decline. Many lay people joined the confraternities which had formed to worship God, banding together for support during the civic unrest and famine, engaging in penitential practices, processions, meeting frequently to sing songs of praise." Many women who knew Frances and were attracted to her way of serving the poor asked her to give formal expression to their way of life. They also felt attracted to Benedictine spirituality which they learned about through knowing the Olivatan monks in Rome. Frances and several other women became Benedictine Oblates. At first they continued living in their homes but eventually they found a house where could gather and live in community. Frances herself stayed with her husband until his death. 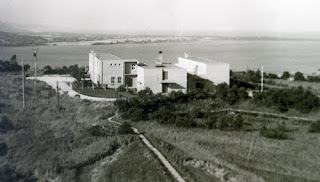 Again Susan Anderson Kerr: "In founding this group of oblates, Frances created a hybrid. She transformed the medieval practice of bringing child oblates to monasteries, by combining features of this practice with the new lay spiritual path of tertiaries which had arisen in the high Middle Ages. What Frances created was the union of lay with Benedictine spirituality, grafting lives of laity called to this vocation onto the Benedictine vine." However, Frances' foundation did not in time become a prototype and so was not reproduced anywhere. Many of our own oblates here at St. Benedict's Monastery can surely identify with aspects of Frances of Rome's life and are inspired by her example. 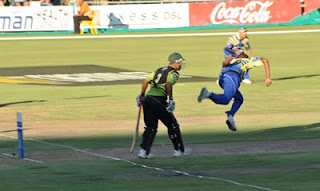 One of the most exciting recent experiences my students and I have had here in Port Elizabeth, South Africa, is Cricket! Yes, we went to a local Cricket match that lasted for an evening rather than the lengthy 5 days for which Cricket is famous. 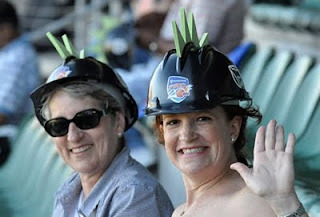 The Warriors of Port Elizabeth were expected to win the game we attended on Friday night, February 20. We all got tickets for a mere 45 Rand (approximately $7.00) and were able to sit wherever we liked in the stadium at St. George's Park. As we entered we all received the Warrior hard hats you see us wearing, the green spikes indicative of the Warrior colors. The game was as exciting as any Twins game in Minnesota, because the band played throughout the game and helped the crowd to note highlights and major plays just as at home. The fact that I had no clue what was happening in the game made little difference, because I could tell something great occurred when the crowd was on its feet yelling and whistling. The South Africans are totally devoted to this favorite game of theirs and are equally devoted to rugby and soccer. Perhaps in the major preparations for the Soccer World Cup that they are hosting in June and July of this year, they have become even more passionate than usual about their favorite sports. Prior to the game, we did not know where to park, and so we went early---Jennifer, Dottie, and I---and found the entrance to St. George's Park. We parked and started walking through the park when we suddenly heard a woman behind us saying, "I am following these brave women because they are walking in the park." We asked this woman what she meant. She told us that she has worked for many years at St. George's Hospital directly across from the park entrance, and she has never walked through the park. Local residents simply know not to do this because they know that people who have dared to walk through the park have been robbed, stabbed and even murdered. We all were extrememly grateful to this brave woman who was kind enough to give strangers advice. We moved our car closer to the Cricket stadium and felt much safer. The vendors selling peanuts, hot dogs and other goodies reminded us of baseball games as well, but one major difference informed us of a specifically South African custom. Of course, at sports games, fans love to drink beer. I noticed that many fans were bringing mugs to their families and friends and that one had to go out to the vendors under the stadium seats. What I had not noticed was that the fans who had been bringing beer to their friends were all men, but when I found the Castle (a huge beer label in South Africa) Bar, I realized that I was the only woman standing in line to buy my beer! When I asked for only one beer, I was looked at askance because the usual buyer brings at least half a dozen for his friends. Later, by asking other people, we found out that the men buy the beer, even though women do drink it! Besides cricket at St. George's Park, a group of students and I went to see a Shakespearean play at the Manville Outdoor Theatre on March 5th. The Manville players staged Othello with expertise and excitement. The performance was well done as one student said, "I even understood the plot and usually Shakespeare is so hard for me!" Oh, by the way, the Warriors won the game and are now in the playoffs! When one extends an invitation to God seekers with words like Come and See or Come and Experience Life in the Monastery it puts the one who invites in a rather vulnerable position. What shall they see? What shall they experience? This invitation was extended to women of the College of Saint Benedict and men of Saint John's University in a cosponsored (Saint Benedict's Monastery & Saint John's Abbey) Spring Break Vocation Retreat. Three young men and two young women gave themselves wholeheartedly to the fullness of this invitation. And what did they see? They saw doors being opened to them, releasing the mystery of the unknown and finding them to be places of home. They saw a community of mixed generations living with intentionality, being present to and extending genuine care for one another. And what did they experience? They experienced the community at prayer. They discovered in the places of silence, that holds the prayer, that this is where God speaks. The rhythm of daily communal prayer, the work of God, both challenged and affirmed their desire for union with God. The practice of lectio divinia invited deep listening and an inspiring means for breaking open God's Holy Word. They feasted daily at the Eucharistic table. The table where deep hungers are fed. They experienced community as they lived with the monastics in settings that fostered the sharing of stories, leisure, play and rest. Community, a place to be at home and to trust one's place of welcome in the midst of others. They experienced service, the sharing of muscle, compassion and an openness to learn as they worked for Catholic Charities Food Shelf and Habitat for Humanity. They saw the faces of their sisters and brothers seeking dignity of service in their poverty of need. They worked side-by-side with generous individuals who give of their time and gifts in small and great ways. Brother Paul-Vincent and I were particularly impressed with the generosity of these students in all facets of their time with us and the wonderful way in which they had come together to BE community. They were once strangers, and now they left us as friends in Christ. photo: The two CSB students who participated in the Spring Break Vocation retreat with the Sisters of the Welcoming House living group, with whom they lived during the retreat. March is U.S. Women’s History Month. This honoring of American women officially dates back to 1981, when Senator Orrin Hatch (R-UT) and Representative Barbara Mikulski (D-MD) co-sponsored a bill to set aside a week honoring U.S. women for their contributions to the nation. In 1989, Congress expanded the celebration to a full month. Many may be unaware that there is a National Women's Hall of Fame in Seneca Falls, New York. This was established in 1969 and, as of 2010, 236 women are inductees. Nominated from all fields of life, they made significant contributions to the nation through outreach or impact beyond their own particular time and place. Among those in the hall are names one might expect: Anne Hutchinson, Abigail Adams, Dorothy Day, Willa Cather, Dorothea Dix, Helen Keller, Beverly Sills and Ruth Ginsberg. I am very pleased that at least one canonized saint is among the members: St. Frances Xavier Cabrini. She is cited primarily for her contribution to education for immigrant families. It occurs to me that we could have our own Benedictine Hall of Fame—strong, grace-filled women who are our role models and surely have made solid contributions to the Church and society in general. I would nominate for membership our community leaders who, in the late 1920s, courageously foresaw the need and carried through construction of the St. Cloud Hospital and also Sisters Lioba Braun and Philomena Ketten who helped found the White Earth Indian Mission. The list could be much longer, of course. Who would you include? 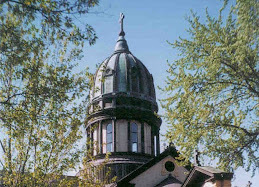 Recently I was interviewed by a first year college student who is doing a research paper on a topic something like, “The Effect of the Women’s Movement on the Monastery and College of Saint Benedict.” In the course of our discussion, one of the topics that came up concerned the ways in which we as Sisters had begun to have more contact with lay women as they took jobs right within our monastery living and work areas. We have had the help of lay women as receptionists for many, many years. I believe it is twenty years or longer that lay women began to work with us in our Monastery Dining Room. In earlier times that inner sanctuary would have been staffed only by Sisters. We have had lay women nurses taking care of our health for several decades. It must be almost twenty years since Elaine Wenning became one of the major lights in our business office. Recently lay women have become invaluable in the Development and the Leadership Offices. Our wonderful Volunteer Services have brought both lay women and lay men into our midst; however, the majority of these volunteers are women. I believe we cannot overestimate the value of these lay women’s influence. They enrich our lives daily. One of the teachings of Vatican II established the fact that the vowed religious vocation was not higher or better than the life vocation of the lay person. In addition, the beautiful statement on the universal call to holiness was clearly expressed in Vatican II. Perhaps some of these teachings were influential to us in our newfound relationships, but my guess is that it was the lovely experience of getting to enjoy the presence of our lay sisters that has made us value and treasure this relationship. In turn we have found out how heartening the support of these women has become as they take on the many interests and causes of our monastic life together. We have found them to be our dedicated and loyal allies. 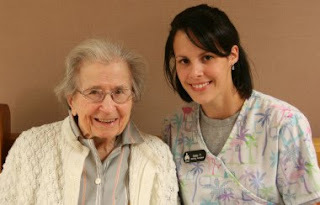 photo: Sister Rebecca Schmidt and nursing assistant Nikki Treb at St. Scholastica Convent.